I think I've mentioned that my Mom is the best - she really is! She has helped me SO MUCH over the last few weeks that I couldn't have pulled everything together without her. 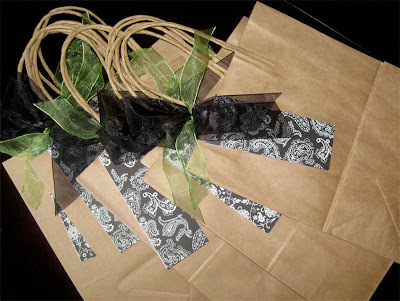 For instance, she purchased and put together the hotel treat bags pictured above. She actually created the black & white "hang tags" (w/ message inside) out of blank note cards she found at Hobby Lobby. She also found all of the ribbon and secured the bows to the bags. 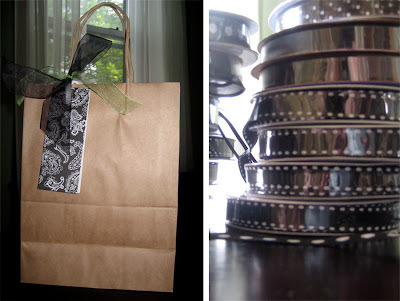 I filled them with yummy goodies last night - they're off to the hotel this afternoon. My MOH came over yesterday and helped me fold 125 programs. We also used the black & white ribbon (pictured above) to secure the programs...I love how they turned out (pictures to come after the wedding). It's amazing HOW MUCH ribbon you actually need to finish projects. Does anyone else have similar stories? Like most brides, my Mom and I have been living at Hobby Lobby, Michael's or any other craft store we can get our hands on. 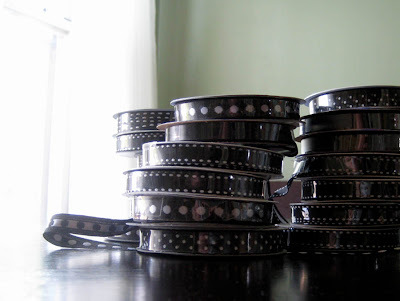 Ribbon, votives, apothecary jars, frames, more ribbon, bags, tissue paper, cards, more ribbon...the list goes on! So, only 2 more days until the wedding. I CAN'T wait! I can't believe the day is finally here!! I'm not too stressed, however Luke might argue differently. We're having more issues over the car and who's driving who when than anything else. Besides packing for the honeymoon, I'm in really great shape (need to do that today). I wanted to say thanks to everyone who has been keeping up with my blog and sending well wishes - you're all awesome! I can't wait to share all the photos and details once I'm back in a few weeks. I will definitely keep blogging well after the wedding. I'm so excited to start more projects and work on other people's invitations. See everyone in a few weeks....Kelly. 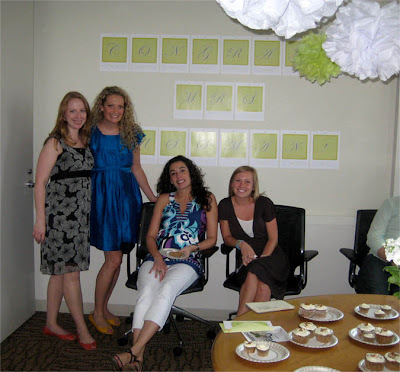 I have awesome colleagues - they threw me a surprise bridal shower yesterday! 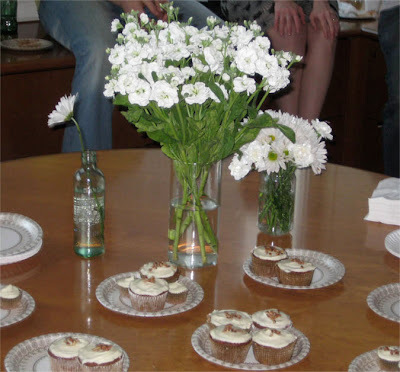 The room was decked out in my wedding colors and the carrot cake cupcakes were to die for. 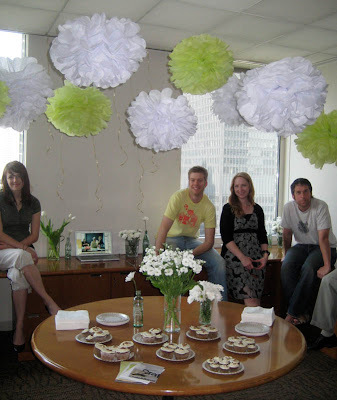 Check out the super cool tissue paper flowers/balls that were hung from the ceiling...many thanks to Kari and the team! Only 4 days to go! 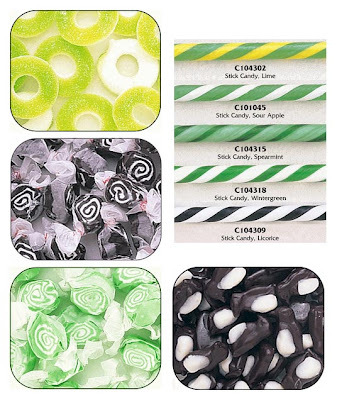 I ordered my black, white and green candy for our candy buffet this week - it should be here by the weekend! We're having a combo "candy buffet/sweets table" at our reception. I'm not going crazy on the candy options because we will also be having pastries, cookies and cupcakes for our guests. I ordered the above goods from Candy Warehouse. I was actually inspired by Laura over at soon to be koo on the candy choices. 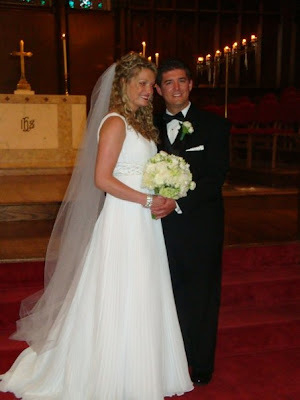 She is another Chicago bride blogging about her big day...and she also has a black, white and green color scheme. She did a great post on candy awhile back, and I was instantly inspired. I think she has since changed her mind, however, and is going with individually bagged, locally-made maple cashew granola for her favors. Definitely check out her blog! A sixpence in your shoe? 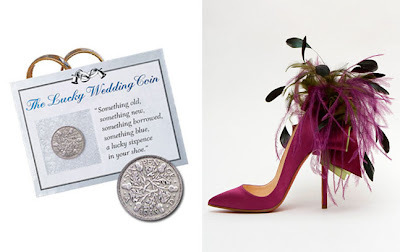 a lucky sixpence in your shoe? I haven't given this last "sixpence" portion much thought. What is a sixpence (I was kinda asking myself this question)? According to sources, it is a British silver coin that was minted beginning in the 1500's, through 1946. It is believed that if a bride sticks one in her left shoe on the day of her wedding, it will bring "wealth and good fortune" to her marriage. I'm not so sure about this tradition. I don't have a "sixpence" coin and with only 11 days and counting, I'm not so sure ordering one is on the top of my priority list. Then there is the whole issue of "where is this coin actually going to go in my shoe"?! As previously shared, I'm wearing flat, grecian sandals that don't have much "shoe" to them. Are you planning on sticking a sixpence in your shoe? 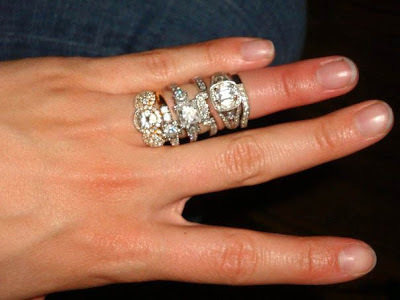 Or maybe you recently got married and included this tradition in your special day? I'd love to hear some reader's thoughts on this? Image sources from here and here. Today has just been one of those days. It's monday, ugh, and I'm moody. I feel like I have a million things to do. Only 12 days left until the wedding - I can't believe it! I'm so excited...and so busy! 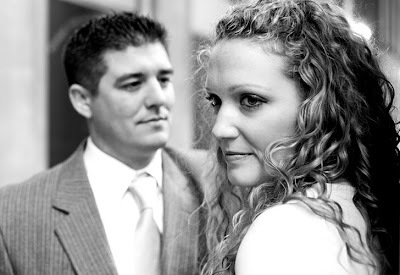 I thought I would share this "moody" photo of Luke and I. A friend of a friend who is starting her own wedding photography business took an impromptu "portrait" session of Luke and I back in April. I've only gotten a sneak peek of the images so far, but I'm loving the overall style. The shot above is very artsy and dark. Luke doesn't think it looks like "me," but I think that has something to do with the high contrast. 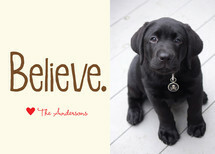 Cadence, the photographer behind the shot, has enlisted my help in designing a custom logo for her new business. Check out more of her great work here. 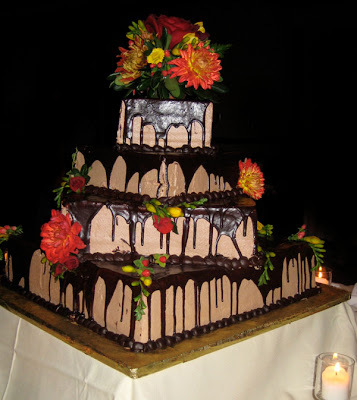 I came across this photo of the cake a friend had at her wedding last fall. It was chocolate mousse with raspberries...and it was yummy! Anyone given any thought to their napkin fold for the reception? 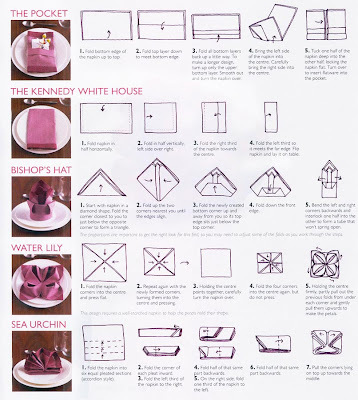 I think I'll be going with something fairly simple and flat - such as the "pocket" or "kennedy white house" fold - as not to take away from the rest of the decor on the table. The "wedding industry" is great - just when you thought there wasn't much to think about regarding the cloth you use to wipe your mouth, there's an entire online community dedicated to proper napkin folding! Gotta love it! Image source here. There is just something about coral that I love. Maybe it's the color, or the intricacy of the shapes. I actually contemplated using it as a theme for our wedding, but it just didn't seem appropriate for a Chicago wedding at a country club. Needless to say, I've still found a way to incorporate it into certain parts of my life (and home). The middle photographs are actually of the entryway in our condo. 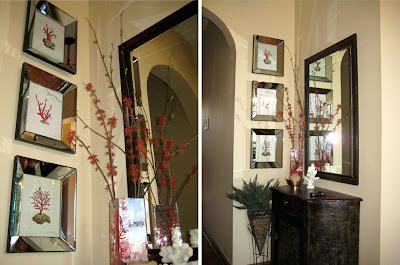 I love, love, love the coral prints I found with the mirrored frames. I bought them at a local Lakeview boutique. The glass vase also has coral printing on it and is by Fringe Studio. Here it is. Finally, the bottom photos represent a fun way to bring "coral" into your life...china and jewelry! I seriously contemplated registering for this china at Bloomingdales, but decided against it after seeing the prices. It's very cool, but maybe a bit impractical?! The earrings are pretty, and can be purchased at Muylinda on Etsy. 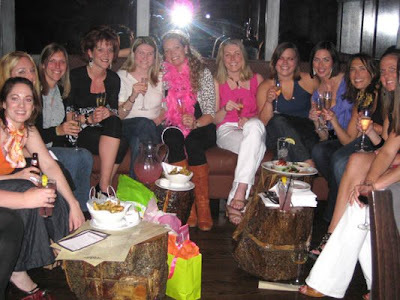 Just some fun photos from the bachelorette party the girls threw me this past weekend in Chicago. 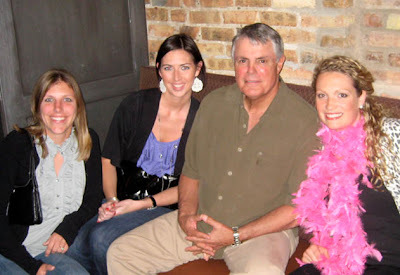 I had so much fun and we even got a photo-op with Lou Piniella (Chicago Cubs manager)! I also was sporting a pretty sweet "TP-inspired" wedding gown at some point in the night...thanks to everyone for showing a girl a good time! You're the best!